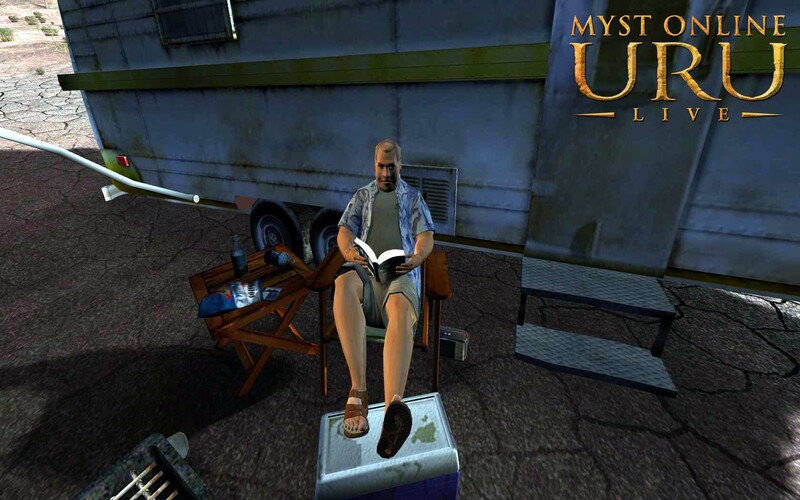 Myst Online: URU Live Forums • View topic - Game clue on Zandi's sandal? Game clue on Zandi's sandal? Post subject: Game clue on Zandi's sandal? I had a question, did some research and couldn't find anything to answer the question so I've brought here for the scrutiny of all MOULa experts. Enjoy! Not long ago on a cold, gray, rainy day, with the MOULa server being down, I was hopping around on the internet as one is prone to do when just killing some time. I was doing a little research, regarding URU / MOULa, and came across a webpage showing a pic of Zandi, as is his habit it seems, lounging in front of his trailer at the Cleft. Something caught my eye and upon further scrutiny, I noticed something odd about the soles of Zandi's sandals. It appeared as if there was some sort of design to be seen. While it's not odd or even out of place for the soles of some shoes to have some sort of a geometric design, what I saw did indeed seem out of place, being as it's on the bottom of a sandal. The central part of the design might appear as if it's a continuation of or a part of the upper sandal strap being attached to the bottom of the sandal. That doesn't make any sense to me as that would bring it into contact with the ground while walking and it would, in time, just wear away. Planned obsolescence perhaps, but I think not! So, I increased my browser page zoom to 200%, then 400% and then 600%. The closer I looked, despite the increasing size of the image's pixelization, the more it looked like "something" that could be connected to the game itself. Tilting one's head to the left, and yeah, sorry I didn't do the "rotate pic" thing before uploading, perhaps one can see a "volcano cone" in the middle, a buried cavern to the right and who knows what to the left. A well hidden clue perhaps! Or... I'm just really, really bored and seeing something that's not really there and definitely need to get a life? What'cha think? About the design on the sole of the sandal, not my needing to get a life, that is. I enjoy MOULa, so that particular question has already been answered. In light of the D'ni's knowledge of quantum theory as the mechanical basis for the "art" of writing “linking books,” it's very interesting that Zandi is reading a book about quantum theory / mechanics. I just wouldn't have figured "him" for that. "Ordinarily, I'm a wee bit insane, but I have do have some lucid moments when I'm just merely stupid." Anyone who followed me or saw me up on a collision with my sandals saw this design. You're just reading too much into something that appears to be a typical sandal bottom. It's the same as seeing things in the clouds. Every sandals have those waves under them. That's not the exact same, notice two different spots on Zandi's sandal bottom? His is slightly different. A scribbly line (which is text) and a yellow circle (which is an eye). The sole of Zandi's sandal says WHARKS in yellow text! There is also an eye texture added on the sole of his sandal! Some kind of animal eye: Yellow eye with a black pupil. I highly doubt it is a clue for anything though! IF its a clue, I would interpret as saying to look at the whark skeleton there in the desert. That right there is kind of the point. With the incredible depth of detail that has been put into everything from the original MYST to where we are now in MOULa, it is entirely possible, though not probable, that even the slightest thing can be a clue to something. Just for fun, here's a perfect example of something that's very vague and insignificant. In "The Matrix Reloaded" movie, Agent Smith's car license place is IS-5416. Seems pretty ordinary. However, Isaiah 54:16 (KJV) says "Behold, I have created the smith that bloweth the coals in the fire and that bringeth forth an instrument for this work; and I have created the waster, to destroy." Now, is this the case with the design pattern on the bottom of Zandi's sandals? No, I really, really doubt it and like I said earlier, I was really, really bored. Ordinarily, I'm a wee bit insane, but I have do have some lucid moments when I'm just merely stupid. The sole of Zandi's sandal says WHARKS in yellow text! "Step right up folks and get em' here. Yes, yes, yes, friends, all you URU'ites, cavernites and gamers of all things MYST'y. You now have the unnbelievable, once in a lifetime opportunity to purchase the footware of choice, worn with the appropriate fanatical gaming fervor, by the members of the newest online cult around, "The Souls (soles?) of Zandi's Sandals." You've had your Uggs, Crocs, Burkenstocks, Earth Shoes, assorted Flip Flops, Shower Shoes and even the classic Mexican Huarache sandals with the used, tire tread soles. Put all that behind you now, join us in bringing excellence in footware to surface dwellers everywhere. Get a clue, Lou. Don't miss the bus, Guss. Get in on the latest thing in the D'ni multi-verse, the new and improved, orthotic friendly "WHARKS" sandals! OK, Sorry. Enough of that! Originally the observation was going to be along the lines of a posting that read "Hey, what's up with that design on the bottom of Zandi's sandals? Never noticed that before." To my own low brow amusement, the tone and length of my post just seemed to take on a silly life of it's own, as I see this post has also, and was mostly meant to be "tongue in cheek" with no real serious intent towards discovering "something new." I seriously doubt there is anything left to find in the normal aspects gameplay or to be discovered in a game that has obviously been well scrutinized for the last 10 years or so, by some very sharp, observant, intellegent players who have gone over everything with a "fine toothed comb." To expend any further mental energy on this subject would probably tear a major hole in the time-space continuum, sucking us all into the pitch-black nether-abyss! Do you really want the weight of that responsibilty on your shoulders? No? Well, neither do I, so for now I'll just get back to finishing my Fruit-Loops. Well, I don't know if it's supposed to be a clue.. but recently another poster revealed that... .[spoiler]..the D'ni goggles we find in the Cleft...[/spoiler] are specifically based on an actual style of goggles... Cebe 500 leather/ glacier goggles. They are no longer manufactured, but I think they still were being made at the time Uru was being created. The immediate theory that pops to mind is that these were the actual goggles Rand Miller owned and wore on his neck thru the Myst series-- even in the first Myst, and the fairly choppy images you can see he's got SOMETHING around his neck, and the goggles are visible in the much clearer Riven and Exile images of Atrus. So I think it's possible, since Zandi is based on a real person, those were the actual style of sandals he wore on the day he showed up for the photos, which became the source of his final image in the game.... and they've been incorporated into the game. So.. my theory: somewhere out there, these sandals actually exist as a style, and they can be purchased. The texture is pretty blurry, almost is completely unreadable. But here is where the text lines up in yellow and the eye circled in red. What do you mean? 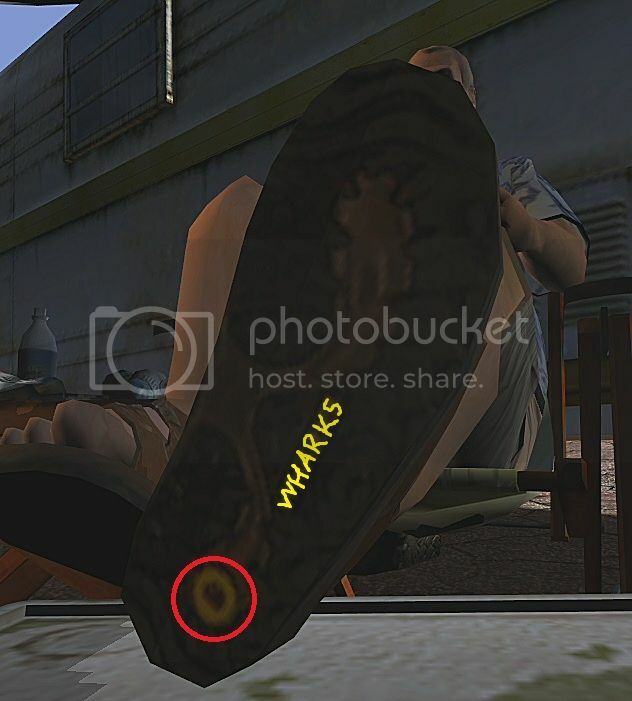 I wasn't joking, it really says "WHARKS" on the bottom of his shoe. I would guess it's supposed to be their joke brand name, kind of like D'nitos. The brown part could be interpreted as a map fragment. However, the only resemblance that comes to mind is the 2nd half of Eder Kemo. The "eye" would be where the floating monolith is found. WHOBA indeed!!! Thank you Zardoz! I about choked on my morning coffee when I saw that. It was all I could do to not have a coffee coated LCD screen. I actually had to wipe away a few tears of joy from my eyes. WAY too funny for 1st thing in the morning! If that be true, I would hazard a guess that Zandi's sandals are perfect for "wharking" around the New Mexico desert sands. He'd probably "whark" for miles for another bag of Ranch flavored D'nitos if he wasn't afraid of coming across the "Warking" Dead zombies outside of that perimeter fence. It never fails to amaze me to see how certain threads, can and do take on a life of their own. The creativity and wit of the forum posters is certainly a thing to enjoy.